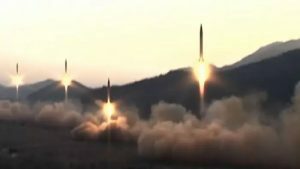 Could North Korea Be A Tribulation Trigger? ISIS terror has hit Paris again and North Korea is threatening to wipe the United States off the earth. These two different peoples with two different agendas, halfway around the earth from each other, are engaging Europe and the US in war. Will both ISIS and North Korea play a role in triggering the Great Tribulation? 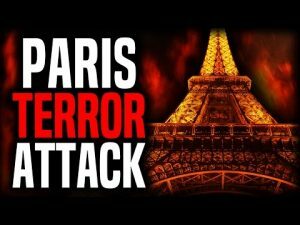 The Islamic State claimed responsibility for killing one police officer and seriously injuring 2 other officers on the famed Champs-Elysees in central Paris just days before the presidential election. The shooting could change the outcome of the elections. Why does ISIS focus its terrorism on France? The French are a mixture of various peoples and tribes who settled there eons ago. Historians, anthropoligists and other scholars have traced the tribe of Reuben to northern France. Over the millennia, the blood of Reuben has mixed with that of the native tribes there. It is Reuben’s descendants that ISIS is going after. But why? ISIS is Amalek. Amalek is the most aggregious and violent grandson of Esau. The Amalekites raided the edge of the Israelite camp in the wilderness. There was war between the Children of Israel and Amalek. YHVH commanded that His people should kill Amalek in every generation because Amalek will never leave us in peace. YHVH promised there would be war with Amalek in every generation. Unlike the way wars are now fought in the Western nations – wars that are never intended to be won, but to continue indefinitely in order to line the pockets of the elite – Amalek intends to put an end to all of Jacob’s descendants once and for all. The way to conquer a people is to capture its leader or king. For Amalek, the physical primacy of the firstborn is of utmost importance. They reject Esau’s loss of birthright and blessing to Jacob. They claim, via their Catholic Edomite-created church, that Jacob stole those from Esau. We know that the birthright and blessing were intended by YHVH to go to Jacob, but they reject YHVH and all that He says. Being strict believers in the right of the physical firstborn to inherit everything, they are going after Reuben who is Jacob’s physical firstborn. Amalek, ISIS, does not care that Reuben is no longer in line to inherit everything promised to Jacob. All they know is that Reuben is the firstborn and where Reuben is, they are. Where they both are is in France. Amalek will not stop at doing away with Reuben. They intend to continue until they kill off every descendant of Jacob. They will leave no one who might have a claim to the birthright and the blessing. Ultimately, Amalek will go after all 12 tribes, but the first to be threatened by the Edomites are the firstborns, Reuben, Judah and Joseph. Culture has a very long memory, but DNA has an even longer memory. Our DNA deposits the traits, good and bad, of our forefathers within us. It is this that drives us to act as we do. Amalek is driven by an ancient, and unforgotten, history of hatred and rage toward the children of Jacob and it is literally in the genes of the Amalekites to kill us. They are going after the hidden and physical firstborn, Reuben, and the visible and kingly Jews who were given the sceptre of authority. After killing off these two firstborns, they will go after the descendants of Joseph who are still largely hidden within the Church. Their motto is to kill ‘the Sabbath keepers and the Sunday keepers’. It is easy from scriptures to see the plain truth about the role of Amalek in the coming Great Tribulation, but what about North Korea? The escalation between the ‘red’ North Koreans and the West is increasing daily. No one knows with certainty whether North Korea can live up to its promises to wipe the US off the map or if their claims are mere bluster. We can know the North Koreans by one trait they have in common with Esau, the color ‘red’. Esau was physically a ‘red’ man and the territory given to him by YHVH was ‘red’ (edom), as well. YHVH wants us to associate Esau and his people with the color red. There exists on the earth two kinds of ‘red’ humans: Those that are physically from ‘red’ Esau, as the Amalekites, ISIS, and those that are ‘red’ in spirit. North Korea, China, Russia – the communist nations – are all ‘red’. They are the secular ‘red’ people on the earth. Amalek is the physical ‘red’ people. The Book of Revelation mentions the ‘red’ horse that has the power to take peace from the earth. This is an Edomite reference that probably refers to the physical and religious descendants of Amalek and to the secular Edomites. Some say this Second Seal has already been opened. Some say it has yet to be opened. I believe this seal has not yet been opened. How do I know? It is because the Great Tribulation has not yet started. The events of Revelation describe what will happen during the Great Tribulation. However, prophecies have near and far fulfillments. I would not be surprised if this ‘red’ giant, North Korea, did not play a role in triggering or participating in war on the earth. In fact, North Korea could play a role in the destruction of the Daughter of Babylon, America. The reason North Korea might be pushed over the edge is because Trump has now pushed its ally, China, to step up sanctions against North Korea. Forty percent of North Korean exports are coal. Much of this coal goes to China. China has now begun turning away North Korean coal and it is stopping oil exports to NOrth Korea. If China follows through with US sanctions, this puts the North Korean economy in a very hard place. The North Korean economy is already thin, frail and on life support. Economic reasons are usually enough to start wars, so this situation could be the trigger that causes retaliation against the United States. Both China and Russia have moved military hardware and troops to their borders with North Korea. In a war situation, they will not fight against North Korea, but will target US interests in the region. But they won’t stop there. Once the fighting starts, these nations will turn their attention the American mainland. The United States, who is the end time Daughter of Babylon, could find herself squeezed between these two ‘red’ peoples on the east coast – by ISIS, Amalek – and on the west coast by the other red nations, North Korea, China and Russia.